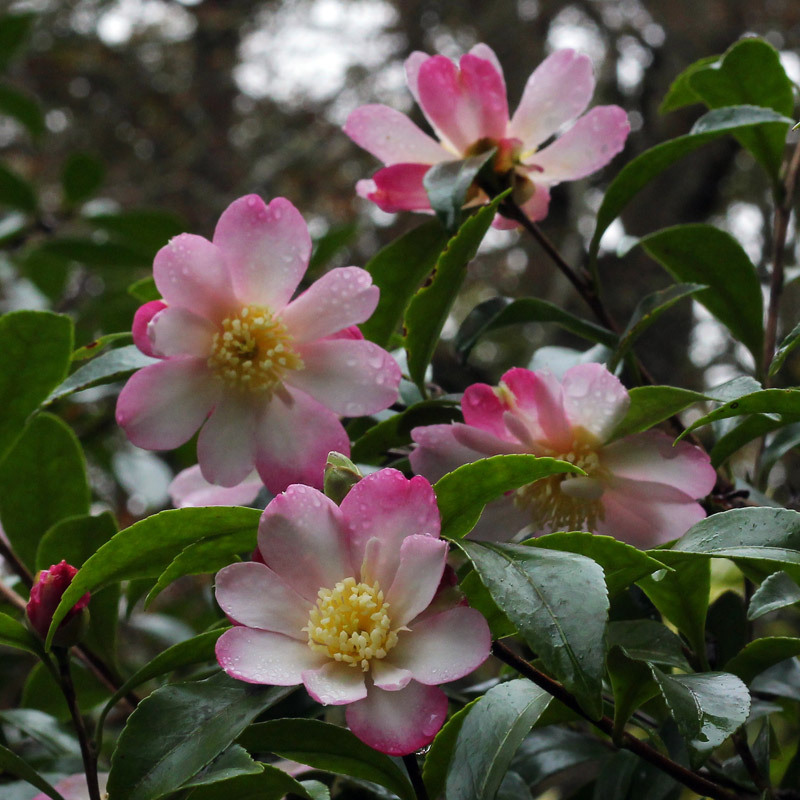 I paid a visit yesterday to the Camellia National Collection at Mount Edgcumbe in the hope that their autumn flowering camellias would be putting on a show. I was not disappointed. The autumn flowering camellias are often referred to as “the sasanquas” though some are forms of the species C. hiemalis, others hybrids. Many originate from Japan, sometimes renamed in other lands; others have been raised elsewhere, mainly America and Australia, which have the most suitable climates. They need a long growing season inorder to produce and ripen new growth, then initiate and produce buds and blooms by the autumn. In the UK they are best in full sun, ideally with the backing of a south or west facing wall. In general they will tolerate poorer and less acid soils that other types of camellias. Most of the Mt Edgcumbe sasanquas are growing in shade and as a result many of them are somewhat shy flowering. Many of them have a tendency to wide spreading, even unruly growth and this might also be offset by lighter conditions. Most of them have a scent of sorts, emanating from the nectar and to my nose somewhat oily in character. It is responsible for attracting many late foraging insects, notably wasps. The blooms will be produced over a long period, from October into the new year, with the best flushes in warmer spells. There are a few hybrids between autumn and spring flowering species and these can have exceptionally long flowering periods. Particular favourites of mine are ‘Navajo’, ‘Cotton Candy’, ‘Sparkling Burgundy’ and ‘Paradise Little Liane’. The first three seem to produce good displays most years, the last is a plant of diminutive stature with sweeter smelling flowers than most.